Konnichiwa! We hope that you are all enjoying your spring. Here is another update of the Lord’s work in Sakai. 2007 was a dry and difficult time at SIBC, but 2008 is shaping up to be a good year. In the past few months we have seen new life, new passion and new momentum that we have not seen for quite some time. For this we give thanks to the Lord. Once again, Easter was a great time to celebrate the resurrection of Jesus. Though we didn’t have our annual Children’s Easter Party, we had a good group at our Easter Service and potluck. The highlight of the day was a Samoan dance and song by our two new friends, Pita and Carol. This spring we have continued thinking about the words of Jesus to his disciples in the Upper Room. Not only did Jesus say that we would do the same things that He did (John 14:12), but Jesus specifically said that we should do them “in the world” (John 17:18). 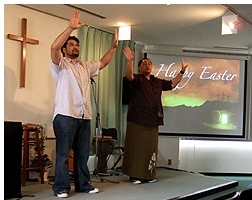 This is a great challenge for Christians everywhere, but especially here in Japan. The need in the “world” is so great that it is easy to be lulled into inactivity because of the size of the task before us. Please pray that the Lord would give us new ideas and fresh strategy for engaging the world around us with the Good News of Jesus. May God stir the hearts of every believer at SIBC to love, serve, proclaim the Kingdom and demonstrate the power of God just like Jesus did. Please also pray for the Spirit to give us boldness to do these things, not just at church, but also in our homes, offices, schools and neighborhoods. To this end, we are also praying for church growth. 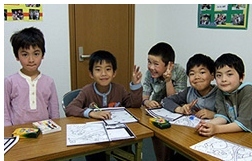 Specifically, we would like to average 50 adults each Sunday by the end of the year. 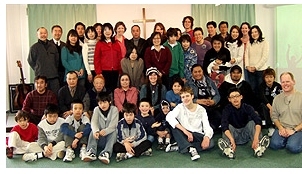 The average church in Japan only has about 30 people, and many churches mysteriously stop growing right around the 40 person mark. We have been flirting with this number for many years now and we are trusting that this is the year that we finally break through. Of course, some people say that it isn’t about numbers, and on the one hand, that is correct. The number of attendees is not the only (or even the best) way to measure the health and vitality of the church. On the other hand, it IS about numbers. There are over a million people in southern Osaka, and God wants ALL of them to be in personal relationship with his son Jesus. May the Lord grant us favor, not just for 50, but for 500! Please pray for us. On Mother’s Day, Chris had her first opportunity in two years to preach on Sunday morning. She did a great job as she looked at the various women who had an influence on Moses during his childhood. Chris is often so busy teaching Sunday school that it is hard for her to find opportunities to teach the adults. Please pray that we could raise up more Sunday school teachers so that Chris would be free to minister in other areas as well. Finally, we want to ask you to pray for relationship-building in the church. In fast-paced Japan, it is so easy for people to be disconnected from one another. For this reason, we are making a special effort in 2008 to create opportunities for our people to connect with each other. As we play together and pray together, please pray that deep bonds of friendship would begin to form. Please also pray that these bonds would cross the generational and linguistic barriers that exist in the church. This summer we will be in the States for two months of home ministry: visiting churches and sharing about the ministry of SIBC. Although we always enjoy our time at home, it is usually a very hectic two months. Please pray for both the physical and spiritual energy to meet the demands of our busy schedule. Please also pray for good times with our families and a chance for a little rest. Below is a list of the churches we will be visiting. We hope to see as many of you as possible, so if you are in any of these areas on any of these dates, please stop by and say hello. Unfortunately, time does not permit us to visit all of our supporting churches, so we have to give priority to the churches we did not visit in 2006. Finally, please pray for SIBC while we are gone. The Leadership Team (Shibuya, Noji & Kajihara) will assume the responsibility for running the church. May the Lord empower them with grace and wisdom to balance work, family and church life during these two months. Again, we want to thank all of you for your prayers and support. We greatly appreciate all that you do. Also, please remember to check our homepage for current updates and photos of the Mason family. May you have a wonderful summer.